Showers this evening, becoming a steady rain overnight. Low 41F. Winds W at 10 to 15 mph. Chance of rain 90%. Rainfall near a quarter of an inch..
Showers this evening, becoming a steady rain overnight. Low 41F. Winds W at 10 to 15 mph. Chance of rain 90%. Rainfall near a quarter of an inch. City and school officials joined the Albertville High School baseball team in dedicating the newly renovated field at Sheldon Elmore Park before Saturday’s 8-5 win over Plainview. Front row, from left, are Logan Richards, Caylor Slivka, Tripp Adams, Cole Robinson, Cody Collier, Nathan Fortner, Tyler Angel, Andrew Stephens, Alex Honea, Brady Beam, Bryant Petrey, Justin Cantrell, Nathan Brooks, Brock Wordlaw and Chase Register; back row, from left, Caleb Marsh, Janzen Powell, Albertville Chamber of Commerce President Jennifer Palmer, AHS Assistant Principal Tony Bright, Albertville City Board of Education President Bobby Stewart, Albertville City Councilman Ben McGowan, Albertville Mayor Tracy Honea, Albertville City Councilwoman Jill Oakley, AHS head coach Jeff Simmons, AHS assistant coach Torrey Croft, AHS assistant coach Brandon Lyles, AHS volunteer assistant coach Caleb Johnston, AHS volunteer assistant coach Barry Dunn and Jordan Slaton. 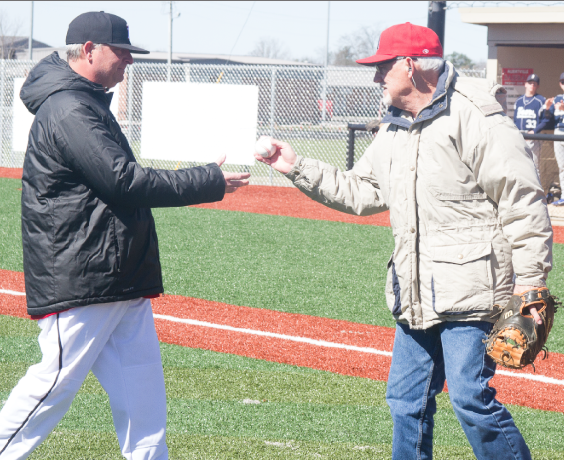 Albertville head baseball coach Jeff Simmons accepts the baseball from his father, Wendell, during Saturday morning’s dedication for the newly renovated field at Sheldon Elmore Park. The Aggies and school officials surprised Simmons by asking him to throw out the ceremonial first pitch, which his father caught. The Albertville Chamber of Commerce directed a dedication ceremony for the newly renovated baseball field at Sheldon Elmore Park on Saturday morning. Chamber, city and school board representatives joined the Aggie baseball team for the ceremony, which included a ribbon cutting, brief remarks by Albertville Mayor Tracy Honea and a prayer by the Rev. Barry Dunn, senior pastor of Albertville First United Methodist Church. The Atlanta-based Sprinturf installed artificial turf on Albertville High School’s football, baseball and softball fields. The Albertville City Board of Education accepted the company’s bid of $1,417,400 for the project last October. Jeff Simmons, who has served as the Aggies’ head coach since 2003, threw out the ceremonial first pitch to his father, Wendell. Simmons, a 1990 graduate of AHS, joined the Aggie baseball staff in 1997 as an assistant coach under Darrell Cooper. He is retiring from coaching at the end of the 2017 season. “It has been really unbelievable,” Simmons said of the new playing surface. “I think by far the best thing is just no lost time. When you show up, you and the kids are doing baseball. The new turf’s drainage system should reduce, or possibly eliminate, rainouts. “Really, unless it’s raining straight down, there are no rainouts,” Simmons said. “It drains unbelievably well, and it’s pleasing to the eye. “The best thing is if it gets the kids excited, then the old fat coach is excited. As soon as people started talking about turf, our kids were just absolutely overjoyed because it was something new to them. The field’s old natural surface experienced multiple problems with drainage since the Aggies moved there full-time in the 1999 season. Simmons said the school board made strides to correct the drainage issues, but was never able to completely resolve them. “I think when our board and our administrators started looking at this, they said this is a problem. We need to be able to get our kids on our field whenever we want,” Simmons said.